A Sèvres dinner-service on display at the Museo delle porcellane di Firenze. A ceramics museum is a museum wholly or largely devoted to ceramics, usually ceramic art. Its collections may also include glass and enamel, but typically concentrate on pottery, including porcelain. Most national collections are in a more general museum covering all of the arts, or just the decorative arts. However, there are a number of specialized ceramics museums, with some focusing on the ceramics of just one country, region or manufacturer. Others have international collections, which may be centered on ceramics from Europe or East Asia or have a more global emphasis. 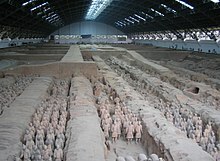 The Terracotta Army on display; view from visitor's gallery. The Musée nationale de la porcelaine Adrien Dubouché in Limoges concentrates on the local Limoges porcelain. The 19th-century building (formerly the Egyptian embassy) of the Tehran The Glassware and Ceramic Museum of Iran. The State Ceramics Museum, Moscow: A dinner service presented by Napoleon to Alexander I of Russia upon signing the Treaties of Tilsit. A bottle kiln at the Coalport China Museum. Many of the historic ceramics manufacturers have museums at or very near their factories, sometimes owned by the company, sometimes independent institutions. Among the more important ones, with large collections, covered in the articles on the concern, are: Meissen porcelain, Nymphenburg Porcelain Manufactory, Doccia porcelain, Royal Worcester, Wedgwood (now independent), Royal Crown Derby and Herend Porcelain. Museu A CASA, São Paulo, São Paulo. Gardiner Museum, Toronto, with 3,000 pieces. Medalta in the Historic Clay District, Medicine Hat, Alberta, 53,000. Yixing Ceramics Museum, 30,000 pieces, mainly from the Yixing area. CLAY Keramikmuseum Danmark, Grimmerhus, Kongebrovej 42, DK-5500 Middelfart. Website: http://claymuseum.dk. Musee de la Ceramique, Rouen, 5,000 pieces, 900 displayed, mostly local faience. The extensive archaeological excavations at La Graufesenque, one of the major production centres of Ancient Roman pottery, are open to the public with a museum on the potteries. Musée Départemental de la Céramique, Lezoux. Musée de la Céramique de Desvres, Desvres. claims to have over 500 ceramics museums, public and private, including ones at Ibaraki, Bizen, Kyoto, Arita (Kyushu Ceramic Museum), and Tokyo. The Arita Porcelain Park is perhaps the world's only theme park based on ceramics. The Hermitage, Saint Petersburg - includes the Museum of The Imperial Porcelain Factory and the famous Frog service made by Josiah Wedgwood for Catherine the Great. Museo Nacional de Cerámica y de las Artes Suntuarias González Martí, Valencia, with over 5,000 pieces, mostly produced in the region. Southeast Asian Ceramics Museum, Bangkok, opened 2005, 2,000 pieces of the pottery of Thailand and neighbouring countries. Museum of Royal Worcester, at the old Royal Worcester factory site. Percival David Foundation of Chinese Art, Bloomsbury, London. 1400 pieces of classic Chinese porcelain from the 10th to 18th centuries. Schein-Joseph International Museum of Ceramic Art, Alfred, New York, 8,000 pieces, including glass. ^ "Museu Udo Knoff de Azulejaria e Cerâmica" (in Portuguese). Diretoria de Museus do Estado da Bahia (DIMUS). Retrieved 2019-02-16. ^ "Gardiner Museum website". Archived from the original on 2003-10-16. Retrieved 2009-05-03. ^ "Historic and Ethnographic Monuments of Vinnytsya Region". 5 July 2014. Retrieved 5 March 2017. ^ "American Museum of Ceramic Art". Retrieved 12 July 2011. Peterson, Jan. The craft and art of clay: a complete potter's handbook, Laurence King Publishing, 2003, ISBN 1-85669-354-6, ISBN 978-1-85669-354-7, Google books Listing of museum ceramics collections (heavily weighted to US) pp. 396–412. This page was last edited on 13 April 2019, at 09:52 (UTC).